In response to concerns raised by residents at the October 1, 2015, special meeting of the Board of Directors (the “Board”), regarding unusually high water usage and utility bills in the August and September 2015 time frame, a self-selected committee of residents recommended and the Board decided to engage BDO to conduct an independent audit of the District’s billing system and procedures. BDO completed its full Phase 2 report, which is available through the link below. No significant issues were identified. The Board would like to thank all of the residents for your participation and feedback throughout this process. Dust off your tennis shoes because one of the best amenities in the District is about to get even better! It is the expansion of the Oyster Creek Trail and installation of new clear span pedestrian bridges along Oyster Creek. 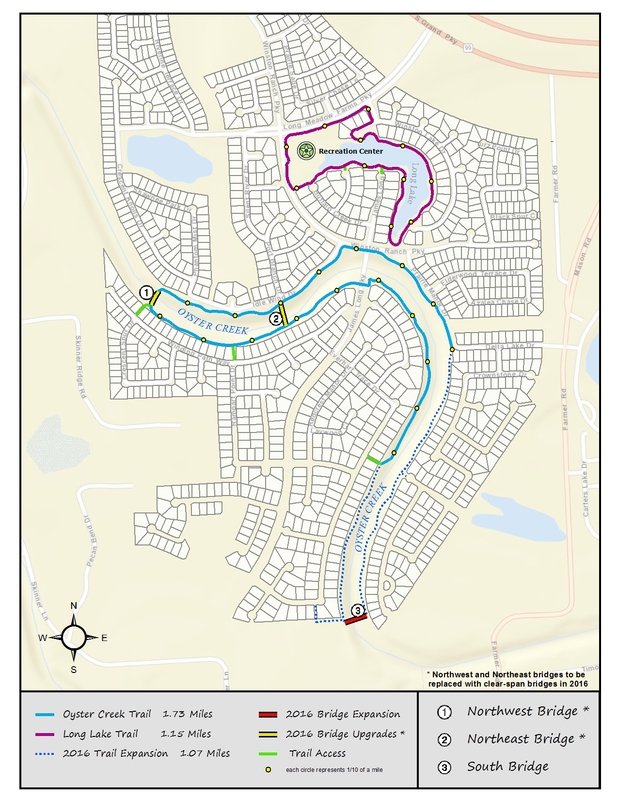 The project, which received grant funding from Texas Parks & Wildlife Department, will begin this spring with the addition of one more mile of trail and the replacement of existing pedestrian bridges with three (3) new bridges. Flagging the trail location in the field, ordering the new bridges and demolishing the existing bridges will be the first order of business prior to construction of the new trail beginning. It is anticipated that the project will take approximately six (6) months to complete once the contractor receives a notice to proceed. The map shows the existing trail and bridge locations, and the expanded trail and new bridge locations. It also identifies access points and provides the trail distances for Oyster Creek and Long Lake Trails (the lake by the recreation and welcome centers). For questions or comments about this project or other District matters email the District at the following link: http://www.fbmud146.org/contact/.